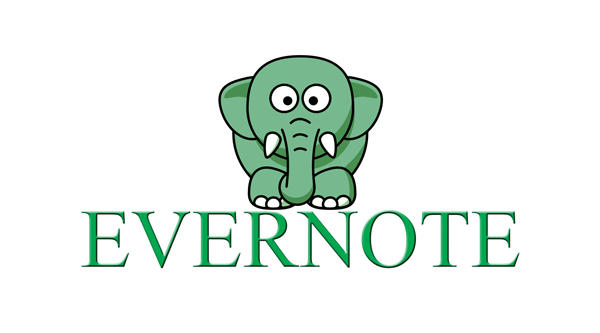 Evernote is a free program that enables a person to collect and keep track of their thoughts and research in one quick and easy-to-use program. Best of all, it can be installed onto both Windows and Mac, along with all the popular mobile phones and tablets. And if that doesn’t suit you, Evernote can also be accessed and used by any browser. As soon as everything was installed and the account was created, I was ready to go. In seconds, I was creating new notebooks and compiling notes and links and photos from the all over the place – like my mind, the web, and my computer’s files. It didn’t take long before I had created a huge mess of random notes and couldn’t figure out how to find anything. Fortunately, Evernote thought of this. For every note you can add tags for easy searching later. What’s more, is you can find your notes by date, source (email, document, web, mobile), or even its content, like PDF, video, images, and even voice. It seems, though, that to get the most out of your Evernote program, you need to download and install different applications. Fear not, though. Evernote has your back. By visiting the Evernote Trunk on the top navigation bar, you are taken to an online application-junkie’s paradise, where you can browse, find, and use a variety of free programs, two of which I found particularly useful. and documents, highlight useful text, right-click, and send the text right into Evernote without flipping windows at all, allowing me to continue reading without disturbance. This add-on would be perfect for online research. Some of the features included in Evernote are the ability to create notes using multiple methods. I was able to make text notes, audio notes – using a microphone, video notes – by turning on my webcam and recording, and even Ink Notes, which is useful if you have a tablet or touchscreen, so that you can write your thoughts down using a virtual notepad. The biggest highlight of this program is its relationship with the Internet. Everything you add to your Evernote is automatically synchronized with your online account, which lets you collect your notes worry-free from losing anything important. As an added bonus to this, you can also share your notebooks with someone else. This can be done in several different ways. You can either send your notes automatically by email, post onto Twitter or Facebook, or send them a link so that they can view your notes in any browser. Added to this, you can also grant someone the ability to both view and edit your notes, which would be great during a shared project, like researching, editing, or even blogging. And if you ever decide you don’t want this person to access your notebook, you can revoke this sharing option at any time. Although I only took a brief dip into the Evernote world, I would definitely recommend this program to anyone looking for a free, simple, and easy way to stay organized. 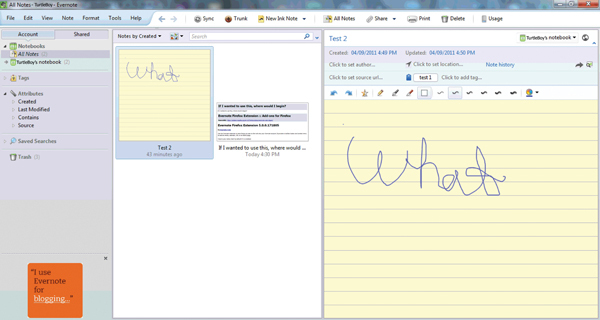 Of course, if asked if I would use Evernote instead of OneNote, I’d have to say no. Although Evernote can function just like OneNote, it places a limit on the amount of ‘clippings’ you can store. There’s a 60 megabyte storage limit, with caps on text, images, and videos. However, this can be solved by purchasing the premium account, for five dollars per month or 45 per year. To me, that’s a deal breaker. I capped out my clippings allowance in under an hour, but I still had 59 megabytes of ‘allowed’ storage left. Needless to say, I deactivated my account shortly after. So what’s the verdict? It’s a great program for light use. If you want more out of your Evernote application, be prepared to spend a little money. It definitely could replace OneNote if you paid for the premium account; however, in three years you would have paid more on Evernote than you would have on Microsoft Office Home & Student. This gives Evernote a big ol’ thumbs down in my eyes.